Crispy wings are the quintessential partner for a mug of frosty beer, or a slice of hot gooey cheesy pizza, or while watching your favorite football / basketball / baseball / hockey / tennis team, or Hollywood awards show. Think of a situation. Now add you eating perfect crispy chicken wings to that situation and it just got better, didn’t it? But wait! 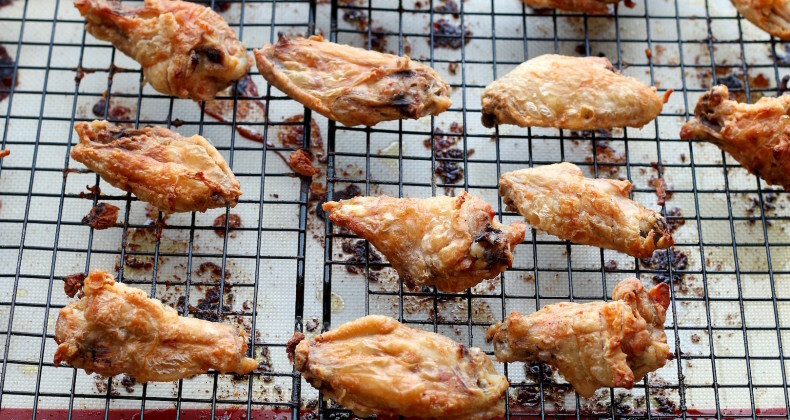 It gets even better because you can get the best crispy wings straight from the oven. That’s right, folks, Crispy Baked Wings! These bad boys are baked not fried! Winner, winner! Rewind (which I just typed as rewing ) about 1.5 years ago when I first came across this recipe. I can’t remember where I first saw the recipe but I know it was inspired by the geniuses over at the America’s Test Kitchen family. 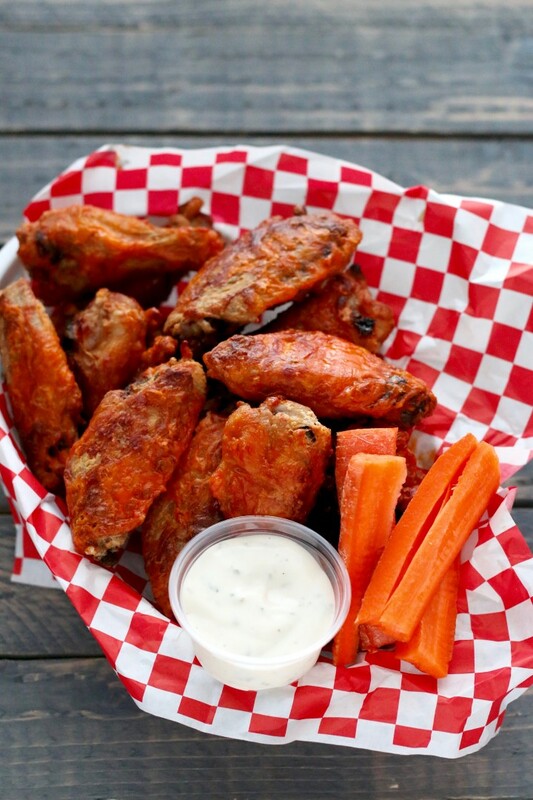 Their mad scientists figured out that the secret to crispy wings was to coat them in baking powder which helped draw out the moisture, render the fat, and make the wings so crispy you would think they were fried. I have made these wings a couple dozen times since first stumbling across “the secret”. And now 18+ months later I feel like I finally nailed the method and am ready to share with you. Just look at those wings! So crispy! A couple things you need to know in order to get the crispiest wings you need TIME, they bake for 1 hour and 15 minutes, but you can drink a couple frosty beers and play Suspend (our new fave game) while you’re waiting. You also need to bake them on a rack. This allows the fat to drip down and away from the wings so they crisp up. I kept it pretty old school this time around and tossed the crispy baked wings in our favorite bottled wing sauce. I didn’t stop there, though. Oh no! The wings get placed back on the baking rack and popped under the broiler for a few. Then you have the option of eating as is or giving them another toss in the sauce. One of my favorite places for wings in town does this with their wings and they call it Char Buffed. It is the way to go! Tell me! What is your favorite wing sauce? Are you a sweet and mild or hot and spicy person? Serve with favorite dipping sauce and cold beverage! You don’t have to watch the game 😉 Perfect for binge watching Netflix too. Haha! Love how easy these are! I’ve been craving wings and these may be the cure! 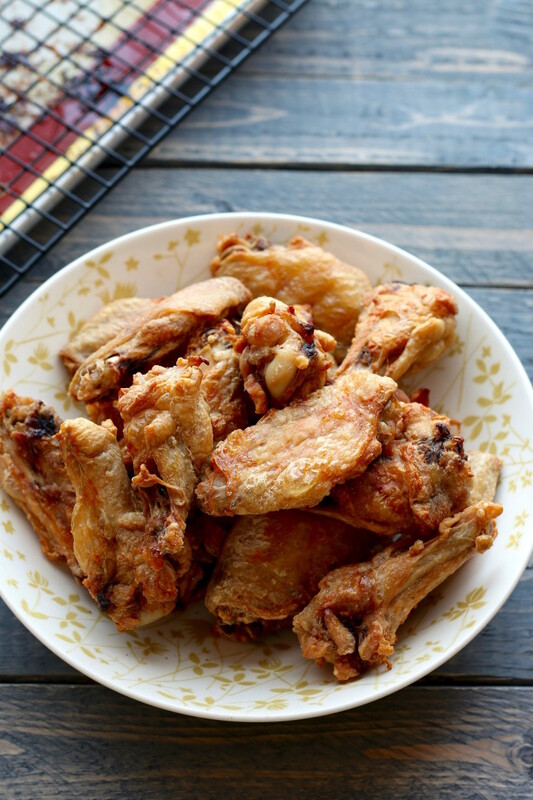 These crispy baked chicken wings are the perfect addition to my super bowl party spread. Thanks! Absolutely perfect for super bowl! Enjoy! I can almost hear the crunch as you bite into those! Stunning. Funny how our bodies do that huh? I would never guess these were oven-baked, just looking at them! I’m not much of a televised sports fan, but they would be perfect for an Oscars party! My favorite wing sauce is mango habanero and then dipped in ranch. It’s sooooo spicy, but sooooo good! Yum! These look so great and so easy. I usually buy frozen ones from Trader Joe’s, but now I know that I can make them own my own. Much healthier, too! I’m looking for the prefect wing recipe for Super Bowl today!! These look amazing! One question, the beginning oven temp is 250. Isn’t that a little low? Should it not be 350? Hi Bonnie! 250 is the correct temperature. It sounds low but it works!